Your guests will love these cute guest-sized soaps! 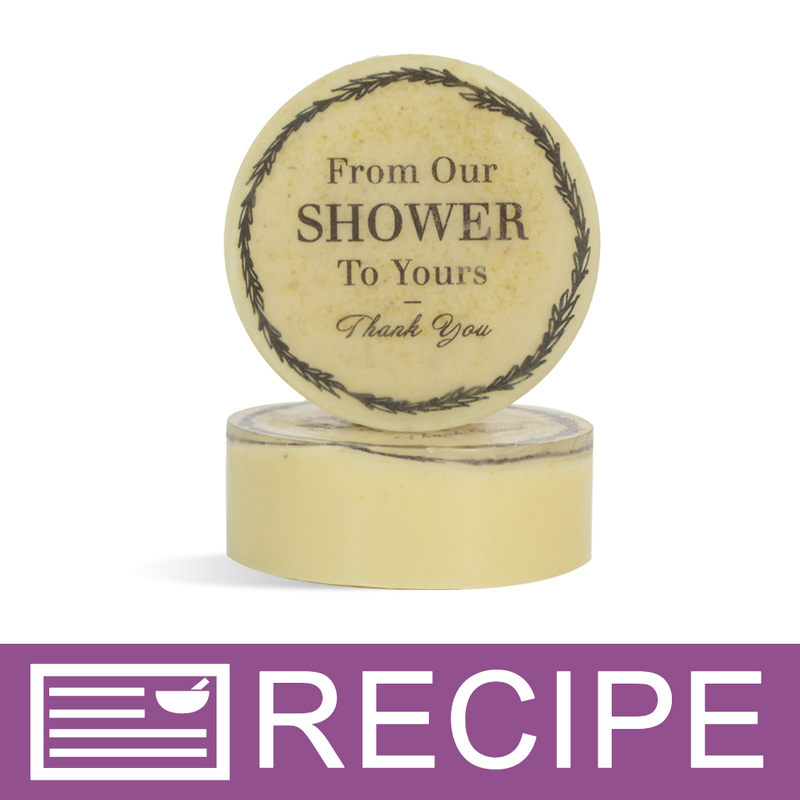 Each oatmeal soap bar says "From Our Shower To Yours, Thank You" and can be used for bridal showers or baby showers. These handmade soaps fit perfectly with most color schemes and have a slightly rustic look while still staying classy. Print “From Our Shower To Yours” graphic (Download Here) on two sheets of embed paper and cut out all 24 designs. If this is your first time using embed paper we recommend watching the Simple Secrets video, Using Embed Paper, before proceeding. (Watch Video Here). In microwave-safe measuring cup, add 2.50 oz. cut up Crystal Clear MP Soap. Heat in microwave in 30 second bursts until completely melted. Pour a thin layer of clear soap to cover the bottom of the mold cavity and place cut out design face down making sure paper is completely covered. Spritz with rubbing alcohol. Repeat with all 12 cavities. Allow clear soap to harden. In another microwave-safe measuring cup, add 15 oz. cut up Oatmeal MP Soap. Heat in microwave in 30 second bursts until completely melted. Add 0.40 oz. (12 ml) fragrance and mix well. Spritz the soap in each cavity with rubbing alcohol. Pour soap into each cavity spritzing the tops with alcohol to pop any surface bubbles. Let soap completely harden. Unmold and wrap soaps with plastic wrap. Repeat Steps 2-7 to make remaining 12 soaps. Ingredient Label: Sorbitol, Sodium Laureth Sulfate, Propylene Glycol, Stearic Acid, Myristic Acid, Water, Sodium Hydroxide, Oatmeal, Myristic Acid, Sodium Cocoyl Isethionate, Glycerin, Fragrance.